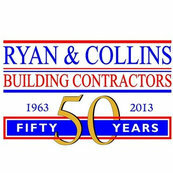 2 Reviews for Ryan and Collins Ltd.
Ryan&Collins completed a major 2 story extension and complete renovation project for us in 2016. They assisted with the design and technical drawings and also with the building regulations in addition to the actual build and associated project management. All aspects of the project were dealt with extremely efficiently. The project management was excellent and the workmanship was of the very highest standard. What impressed us the most though was the sensitivity of the Company and all of their tradespeople in regards to considering us as a Family living through these major works. Obviously this was difficult but the whole process was made easier for us because of the support and consideration demonstrated by all the team at R&C. Consequently we now have a uniquely designed property which we are extremely happy with and which is finished to the highest standards. The project was completed on time, as per a schedule laid out by R&C in advance, and importantly on budget. We would highly recommend R&C for any major project and would also recommend that they are consulted with at the earliest stage possible in a project so that their full range of services can be taken advantage of.